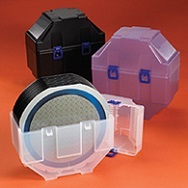 We offer Entegris Film Frame Shippers, designed to provide safety and storage efficiency for up to 25 wafers, or singulated die, mounted to film frames. Replaceable cushion to minimize frame movement and contamination during transportation. Snap Latch to secure closure. Corners are rounded and sides are sloped to facilitate water flow during cleaning. Compatible with industry standard metal or plastic frames. Our product range includes Film Frame Shippers in 150mm, 200mm and 300mm wafer sizes; Replacement Cushions; and Single Film Frame Shippers 200mm. Customers can opt for transparent Polypropylene material which is good for operators’ visibility or the black STAT-PRO® 125 material which is ideal for ESD protection.